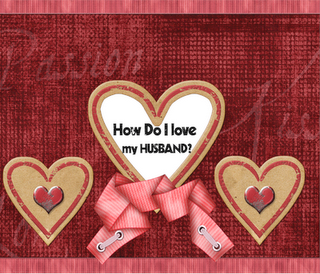 My Sweet Haven: What do you Love about your Husband? Valentine's Day is almost upon us. I'm pretty excited because me and hubby will be driving out of town to spend our Valentine weekend the simple and romantic way away from home. Now is the perfect time for me to blog about how wonderful my Man is. A lot of thanks goes to Michelle for tagging me. He respects me so much. He never raise his voice at me no matter how unhappy he is. He treats me as an equal even if obviously he makes a lot more money than me. He never complains even if I failed with my household duties as a wife. He never boss around. If there is something that needs to be done but I didn't do, he'd do it himself. He loves me dearly and he makes sure to tell me that everyday. He never sleeps without me, hehehe. Corny, eh! but true...it goes the same way for me. Our bedtime is usually 9:30 during weekdays and I'm proud to say that we go to bed together every night. He is so expressive of his feelings for me. Both words and actions. He is so simple and never materialistic. He can easily appreciate simple but meaningful things. He is smart and a bookworm which I appreciate a lot because I love to read books too. He takes very good care of me in all aspects. He's playful and a child at heart. We would sometimes play around the house by sneaking up on each other and yell "Bulagah" when neither of us expects it. I always get a kick out of his reactions when I scare the hell out of him, lol! This is one of my favorite tags :) we get to share our special moments with our other half. ayee! ang sweet naman! 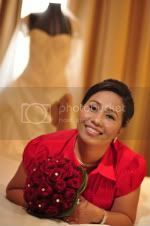 Happy Valentine's Day Jhenn, saan kayo ngayon V-day? wow, this is sweet... happy valentine's day to you both..